﻿ Come on Cavalier man, make my day! I’M sat at the side of the road with a radar gun in my hand, pointing it directly at anyone who dares to break the limit. At my side is Pc Chris Pulfrey, a police rider for the past 20 years and a hard-core bike fan who spends his holidays at the Isle of Man and Daytona Bike Week. We’ve set up a speed trap on an industrial estate and a notorious rat-run out of town. It’s cold and we’ve yet to see any action, but there’s more to being a traffic cop than standing by the side of a road waiting to issue tickets, as I’m about to find out. To break the mood, Chris and fellow police motorcyclist and occasional CBR600 rider Jon Martin start telling me about the last time they were at this hot-spot for speeders.
" It was a few weeks ago and we’d pulled a few drivers for travelling a bit too fast, issued a few tickets and given a couple of people a warning. I spotted this car coming down the road really fast and locked the gun on him. We went through the procedure and stepped out into the road, but there was no way he was going to stop.
" We radioed through his number and got back that he was a known drug dealer who’s been known to carry a Kalashnikov. At the end of the day this job is about safety and it was obvious this was more than just your average speeder, so instead of chasing him we got the other lads to sort it out. Anyway, I’m certainly glad we didn’t get involved as no amount of armour in my jacket will stop a machine gun. " You could be forgiven for thinking this is Los Angeles or even the gangland side of London. It’s neither. This is downtown Sheffield, a town more famous for its shopping centre and nightlife than having a reputation for hard-core gangsters going tooled-up with Russian shooters. If I hadn’t heard it straight from the mouth of two well-respected and experienced bike cops, I would have laughed it off as a joke. As it is, I’m taking part in a real-life episode of Police, Camera, Action and I’ve got a starring role. Stories about machine guns on the streets aren’t the kind of thing to instill confidence. Especially as I’m riding a police bike complete with a blue light and full markings, I’m dressed in a yellow reflective jacket and a white flip-up helmet. Just as those thoughts are going through my mind, Jon shouts from his car that we’ve had a call to go to an urgent job. It’s obviously something serious but I have no idea what. Unfortunately I’m not tuned in to the HQ properly so all I can hear is a faint hissing as I plug the intercom in and fire up my Pan European. All I can do is hope it doesn’t involve guns and gangsters and carry out Chris’ orders: " Stay calm and just tuck in close behind me.... crssssh.... sometimes cars don’t realise there’s two bikes coming through. " OK guv’nor. Jon has fired up the marked Vauxhall Omega and with the blue lights on he’s ready to go. My Pan’s fired up and the adrenalin’s on fast-feed. The traffic behind lets us out of the junction and we’re going through a suburb of Sheffield. You meet the nicest motorists when you’re riding a police bike. The Omega’s acting as our wedge, slicing traffic out of the way as they catch a glimpse of the white and orange car singing its 200-decibel song from the siren and its blues and twos flashing their intent. Chris on his K-series BMW turns his siren and blue lights on so I figure I better do the same, only there’s so many switches on the bike I don’t know which one it is. After blindly fumbling around and trying to keep full concentration on what’s coming ahead, I locate the magic button and the blue stalk is in action. Tucked in behind Chris, I swop sides constantly to keep the best view of the road ahead. We come up behind a car and it takes an age to pull over and get past. It’s amazing how slow some people are to get out of the way. But it’s not only the car driver’s reactions that need testing. Although I’m fully up to speed as a rider, riding in this company is one of the strangest experiences of my life. It’s a bizarre parallel universe where the speeds through towns mean you need to be totally committed and concentrate so hard it makes your brain hurt. Yet it’s strangely free of the normal sounds you expect. With the radio occasionally hissing in my ear and the sirens blaring there’s no engine noise, you can’t hear other traffic and you can barely hear your own breathing let alone the revs changing and the gearbox clunking. Take a look in Police Roadcraft and you’d think they ride like bike instructors, but take it from me it’s hard work. Put yourself in their shoes. You’re riding the bike equivalent of an estate car through tight town streets at double the speed limit and trying to keep your eye on what’s ahead and it’s coming at you like a crazy video game. These blokes should ride the TT, as what they do turns city streets into race circuits. It’s a mind-numbing task and I’ve got a lot of respect for that. As we storm towards the Sheffield Arena, I take a quick glance down at the speedo and check 85mph in a 40 zone. And the best thing is it’s totally legal. The traffic’s queuing but the patrol car’s doing its job of dispersing vehicles to give us a clear run as we approach a set of traffic lights on red. Instinct tells me to stop and then I remember what I’m riding. The pace slows as the car guides our way through two sets of red lights and then picks up again as we get a clear run. Speedo check - 90mph in a 40 through a Gatso and absolutely zero chance of getting nicked. Jon said: " If we’re just driving round and go through a Gatso we’ll get hauled upstairs, but if we’re on a run then we’re allowed to go through them, although we do try and slow down just to save embarrassment. " Today, I am the law. Well, not quite, but I’m at least doing a pretty fine job of impersonating a police officer. And I’m constantly trying to work out if I could out-run Chris if this was me being chased. I reckon I probably could, but he’s so calm under pressure that I’d only end up falling off and he’d get me, especially on his own manor. My 28,000-mile bike is coping admirably with cutting its way through town in the greasy, slimy conditions and the gearbox is constantly on the boil as the pace changes and the road goes from single-lane town roads to more empty dual-carriageways. As we come up to a shiny roundabout for a right turn, I ease back a bit and stick to the left to make a sweeping line out of it. The BMW doesn’t take it so well and hits a particularly greasy line and the front of the bike tucks for a split-second as the bike’s leant over mid-corner. The intercom cuts in and Chris confirms the front did wash out as the patrol car gives it some and gets a bit sideways on the way out. Luckily the Pan hangs in there as it winds up the revs on the way out. The road opens out as we leave the Arena area behind and Jon turns the siren off as we enter a housing estate and a road lined with parked cars and speed ramps. Without warning, we round the corner and find the street is lined with patrol cars. There are seven or eight cars ranging from bobbies’ hatchback Rovers to Volvo T5s and it looks as though the entire fleet of Sheffield’s police cars has landed in this suburb. Unfortunately we’re sent away because it’s game over, but I later find out what the whole thing was about. A patrol car had pursued a bloke in a stolen car into the estate. After a lengthy chase the driver abandoned the car and ran into a field. The officer followed him and got a bit of a clouting when he finally caught up with him, so he put through a call to the station known as a State Zero. Basically, it means an officer’s in trouble so any police in the area head there fast. Unfortunately for us, but not for the officer in trouble, when we got to the job the situation had been sorted and the cars were told to leave as it’s an area where things can get aggravated. Around 10 police vehicles in a delicate estate where the police are seen as the enemy rather than the friend could be just enough to spark a mini riot. That high-speed slice of blue lights and bikes was the highlight of my two days shadowing two police officers, but there’s a lot more to it than that. At the start of the morning we had a full briefing on the day ahead. It’s not quite like The Bill but it’s where the police decide where they’re going to target and what to look out for. There are basic hot-spots which are areas where accidents have been particularly high or where motorists love breaking the limit – so we’re given a couple of areas to make our presence felt. Before we go out, I’m shown some shocking road safety videos from Australia involving some very graphic accidents. There’s a shot of a man’s face lying in a front garden. There’s no head, just a face after a biker hit another car and a lamp-post. It looks like a scene from the Silence of the Lambs and is enough to put anyone off riding ever again. But I’ve got no choice today and the police have no choice but to go and scrape people like this off the road. One of the reasons they’re so intent on keeping the roads safe is that no-one wants to see a life ruined or have to deal with the consequences. The rest of the day is a case of seeing what happens, but we need some speed guns so I’m introduced to the " toy cupboard " . Ordinarily this would really wind me as it’s gadgets like this, and my unfortunate loss of control in my right wrist, that lost me my licence for three months last year. But today I’m on the other side. 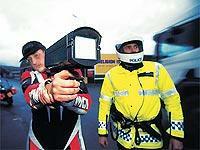 We grab the tried-and-tested radar gun and I’m shown a new laser camera which is deadly accurate, but not well-liked. Chris says: " The laser is a great bit of kit and can get vehicles from about 1000 metres, but it really needs a tripod to keep it steady. It can get bikes from a long way off but, to be honest, bikers are the least persecuted motorists on the road. " Nice to know... or is he just saying that? Next to the toy cupboard is another cabinet any right-minded petrol-head would love to get a free rein over. It holds the keys for every patrol car, marked or unmarked, in the entire South Yorkshire area. Today I’ve got the keys to the training bike, but with the exception of no blue lights on the front and no siren, it’s a full-dressed pukka police machine. Essentially it’s a stock Pan European with extra switchgear, heated grips, luggage and a radio inside the dash. I ask Chris what’s inside the panniers of his BMW, and he reveals it’s more like sandwiches than high-tech police kit. The police garage is more of a warehouse. There are around 10 patrol cars, mostly turbocharged Volvo T5s, a boat, dozens of police bikes and officers’ personal bikes, plus an accident investigation area where evidence is kept after serious incidents. The kit room is full of police-issue gear and white Shoei helmets badged up with officers’ names and numbers and police logos. But there’s also plenty of other stuff that confirms most of the bike cops are real riders, too. We get kitted up and ride through the automatic lift-up door and head out into the wilds of Sheffield. It’s instantly different riding a police bike. You get let out of junctions and people give you space when we’re " making some progress " through the traffic. It’s something that Chris is well aware of after riding every police bike from Norton Commandos up. He has his own bikes, too. He’s just sold a Triumph Tiger and replaced it with a new BMW R1100S. He said: " I find myself riding home sometimes and can’t understand why people are trying to cut me up. Then I realise I’m on my own bike and have to fight back. " As we get into town I pull up alongside a rather fine-looking young lady in a Fiesta and I’m shocked by her reaction. She’s giving me a come-on. Maybe there is something I’ve been missing about blokes who ride round on white BMWs in black leathers and a Sam Browne belt. After calibrating the VASCAR speeding equipment, we go to a hot-spot and set a trap. We’re not hiding as Chris says that’s not what they do, but we are parked down a side-street with enough visibility to see what’s coming. We don’t get anyone so after a quick cup of tea at a local bike shop we set up another trap and nick a couple of cars for not having the right tax disc. And I manage to fail to stop at a STOP sign... " Crssh... that’s three points is that Marc. " My only reply across the radio waves is a startled " Ooops " . It’s getting dark but the gun still reads perfectly and I’m getting a bizarre kick out of standing there aiming it at people. It’s a buzz to point the gun and watch almost every car slow down. We actually nick a couple of people and the satisfaction turns to guilt as a woman is in tears and I consider the amount of hassle she’ll go through for doing 52mph in a 30mph limit and getting caught. But it’s still good to be on the other side for once. After an hour or so we ride round some more – pulling someone for running a red light – and after a quick look around the control room at one of the many police stations in Sheffield we get a call to assist with fitting a monitoring device. Basically, we pull out into the road and stop the traffic as two officers set up a traffic monitoring system to see how many cars are using the stretch and how fast they’re going. If it’s bad they’ll put up speed cameras for a couple of weeks and then study the results. So look out for these black strips on the road as, the next time you ride it, it could be a camera. But the traffic holding is cut short and we’re straight out on another call. I could get into this, but I can’t wait to get on a proper bike and ride free rather than in the spotlight of the public eye.